CPR isn’t as hard as you might think, in fact, it only has three steps. You may be apprehensive about the mouth-to-mouth but that’s not even required. So, you’re in a situation where someone who may be having cardiac arrest and their heart has stopped beating. Oftentimes, people are too afraid to do anything and so do nothing. According to Holly Andersen, MD, cardiologist, just 46 percent of those that are having cardiac issues receive help from bystanders before professional assistance arrives. Often, bystanders may feel afraid and do not want to hurt the person, don’t know what to do, or sometimes, are hesitant to touch the cardiac arrest victim in ways that would be inappropriate under different circumstances. Dr. Andersen also notes that while cardiac arrest events happen in men more often than women, women are 50 percent less likely than men to receive help from those who are witness to their difficulties. The importance of CPR is so high because for every minute without CPR, a victim’s likelihood to survive decreases by 10 percent. This doesn’t have to be true in the myriad of places people have cardiac arrests, especially in the home, where 70 percent of cardiac issues occur. Inaction can lead to a preventable death. Even if you are frightened and do not have professional training in CPR, doing something is better than nothing, preferably hands-only CPR. CPR is short for cardiopulmonary resuscitation. When you perform CPR you are helping the person receive oxygen-rich blood to vital organs. This is vital whether the person has stopped breathing due to heart attack, cardiac arrest, or a near drowning. With these vital organs still receiving blood, the person may have a chance to get emergency assistance. CPR assists the person’s survival because as you press the middle of the chest down, you are forcing the breastbone or sternum up and down above the heart. This up and down movement of the breastbone and sternum causes blood to flow, as you are, essentially, pumping the person’s heart instead of the victim. That is why mouth-to-mouth may not be needed, because a lack of blood is the overaching problem. When you perform chest compressions, you are greatly increasing the person’s chance of survival. According to Dr. Andersen, the brain cells start dying within 5 minutes of losing blood flow and within 10 minutes, the person’s likelihood of survival is nearly nil. CPR must be started immediately to give the person the highest chance of recovery. WHAT KIND OF CPR IS THERE? There are two kinds: mouth-to-mouth and hands-only. 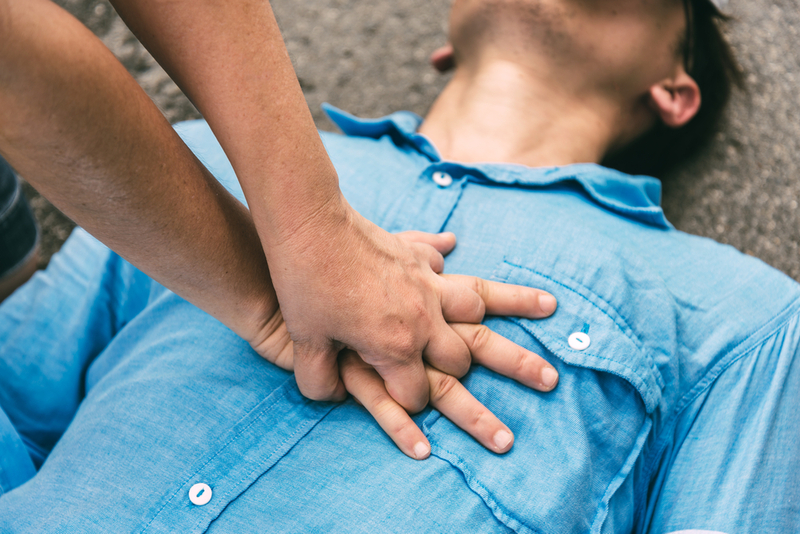 An analysis found in The Lancet discovered that bystanders greatly increased the cardiac arrest victim’s likelihood of survival through hands-only CPR when combined with a 911 dispatcher’s instructions. Hands-only CPR is much safer and accessible for those who aren’t trained when compared against mouth-to-mouth. The biggest risk when you are not properly trained in CPR is that when you switch to mouth-to-mouth you may not do it effectively. When you switch to mouth-to-mouth, and cease compressions, you will lose the pressure needed to move blood around the body. As it takes around five to seven compressions to support the victim’s blood flow, when you stop, you will then have to begin again. During this time, blood has ceased to flow. WHAT SHOULD YOU DO BEFORE STARTING CPR? If the environment is safe for the victim. If the person is conscious or not. If two people are available, have the other person call 911. Grab the automated external defibrillation (AED), if available, and have the other person begin CPR. Use AED, preferably if trained. If alone, and within reach of a phone, call 911, immediately, then begin hands-only CPR. If you have a defibrillator, use it. 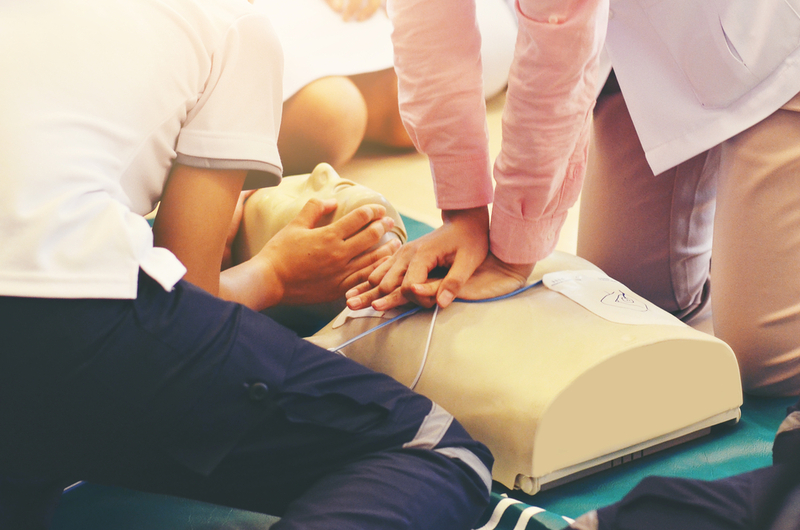 When AED is available, give the victim one shock as instructed by the device, then start CPR. HOW TO DO HANDS-ONLY CPR? Check to see if the person will respond. Tap their shoulder to see if they are breathing or moving. Someone who has experienced cardiac arrest will drop to the floor quickly, not move or breathe, and will turn blue very fast. Call 911 as soon as you determine they aren’t responding. Start chest compressions using your hands only. Keep your arms straight with your hands interlocked. With your palms open, push down fast and hard, with the heel of your palm, in the center of their chest. To get the correct pressure, you must push down 2 inches at a rate of two compressions per second. Compressions must remain uninterrupted and so you need to do 120 compressions per minute. If you sing “Staying Alive” under your breath and continue the chest compressions to that beat, you will perform enough to positively affect the victim’s likelihood of survival. If you are untrained in CPR, it is best to do hands-only CPR. Continue performing chest compressions from 100 to 120 a minute until professionals arrive. Avoid rescue breathing as it’s much more complicated when trying to pair with chest compressions. If you are well-trained and confident, first check to see if there is a pulse and breath. If you determine neither is available within 10 seconds, begin chest compressions. Start with 30 chest compressions and then give two rescue breaths. If you are trained but rusty, i.e. having previously gone through CPR training, but not as confident as you’d like, then just do chest compressions to ensure the best outcome for the victim. These three scenarios should be used with adults, children, and infants who need CPR, but not with newborns (up to 4 weeks old). WHERE TO GET PROPER CPR TRAINING? An accredited first-aid training course is excellent to learn proper technique. This course may include CPR and AED. If you are not trained, call 911, intermediately, and the dispatcher can assist you with proper administration of CPR.